In this episode, I talk about what is done and in progress for my Coney Island simulator/emulator, 1962's Williams Valiant 2-player EM, the 8 Ball ball trough from Pinball Life, a fun repair on a search disc, and some corrections, thank yous, and more! Happy Birthday For Amusement Only! In this episode, I discuss how to try bingo pinball on your own computer. 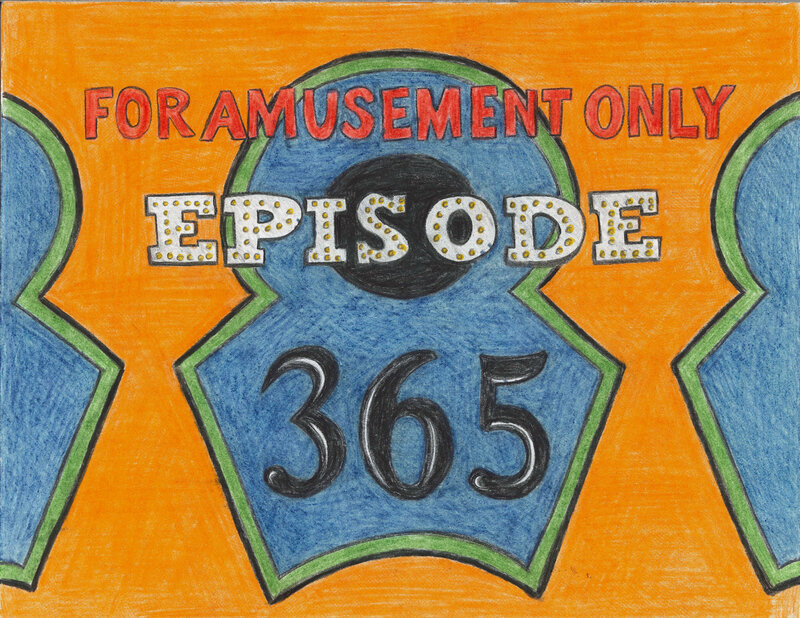 A big thank you to my wife for illustrating the Episode 365 artwork! A fellow named Joop in the Netherlands has been developing bingo emulators, and releasing on the web for Windows and Mac OS X. His simulations are fantastic! Go check them out and try them for yourself. If you have any questions about how to play, feel free to ask me at foramusementonlypodcast@gmail.com and I'll be happy to explain. A person on the Bally Bingos in Britain forums has been using Joop's emulator and putting it into a physical cabinet - pretty cool! Lastly, I've been working on a bingo emulator, fully programmed to change between Bally bingos. I will be using a lower cabinet from a real bingo. This will include the lifter hardware, shutter hardware, trough, tilt, etc. I will use an empty backbox, fit an LCD monitor in the back, and use a computer to both drive and keep track of the game state, and drive the monitor. Playfields will be swappable to allow for multiple games with different playfield features! The vast majority of the games will be playable with any 25 hole playfield. I will eventually release the code for the world to critique, but keep in mind that I am not a skilled programmer (in my own mind, at least). I am using the P-ROC framework due to familiarity with the Python programming language, and the ability of the P-ROC hardware to drive high power motors such as the ball lifter. I'm very excited about the potential for this system, and am looking forward to all the learning I have ahead of me, understanding the reflex and mixer documentation for each game! I've started with Night Club, but then dropped back to Coney Island as it is much simpler and has no backglass animation. Pro Basketball is a cool mannikin arcade game. The basic premise is that it is a one-on-one basketball shootout - you play as the offense, and the defense will automatically move left and right, raising and lowering their arms. You have to watch the score board in the back to determine when you should shoot for maximum effectiveness. Duet is a very beautiful and interesting machine. There are three ways to win, and the player must select before playing, or put in another nickel to load the full ruleset of the game. Completing the sequence of 1-10 will award 20 replays, with the possibility of earning a 'reserve' set of replays - up to 200! I missed one machine from the bicentennial - Liberty Bell is almost a carbon copy of Williams' own Grand Prix. Earning a special requires advancing the starts four times, then dropping all four drop targets. Tough! The spinners have rockets screened on them, to represent "the rockets' red glare". I'm not big on after-factory modifications with few exceptions, but these are very interesting. Also, I saw LEDs used in a way behind a very faded backglass that appeared to work well! Chris Howard's "Golden Gates" - truly masterful! Gottlieb invented a new mechanism for launching balls in 1950 - the turret shooter. This launcher allowed designers more space on the playfield to add targets, and gave players the ability to choose their entry angle onto the playfield. A pretty nifty idea that was used by other manufacturers over the years. Derby Day is a neat take on a flipper game with a horse race theme. The upper playfield contains a single gobble hole and four passive bumpers that can advance one of four horses, whose position is displayed via inserts in the center of the playfield. The bottom portion contains a single pop bumper, which can pop the ball back up to the flippers (in the center portion). You main goal is to advance all four horses to the Win position, then roll over the center button to earn a replay. You can earn many multiple replays by lining up your horses in Show, Place or Win, then shooting into the gobble hole. Slings that work via pressure from the ball hitting a large piece of plastic instead of ganged switches, and pop bumpers that are a single piece of plastic rather than using a rod and ring assembly. On top of that, Galaxy has an under-playfield magnet that will move the ball from left to right, similar to the Mist ball on Bram Stoker's Dracula. Freedom is a fun game from the bicentennial. Bally's take has some more interesting artwork and a fun ruleset. This was one of the changeover games that was made in both EM and solid state versions. The early production had 1776 and 1976 on the backglass, but operators asked that this be removed as it would make the machine 'dated'. Kind of funny for a game themed on the bicentennial.